also Rajkumar Hirani’s top opener. His last release PK opened with a collection of Rs 26.63 crore. The Ranbir Kapoor starrer has opened to a collection of Rs 34.75 crore and has become the first non-holiday release after Baahubali to get such a massive opening at the ticket counters.Breaking the record held by Salman Khan’s film Race 3, Sanju has become the biggest opener of 2018 so far. Salman’s Race 3 cashed upon the festive holiday of Eid and earned Rs 29.17 crore on its Day 1.a film based on the life of Sanjay Duttis helmed by Rajkumar Hirani. 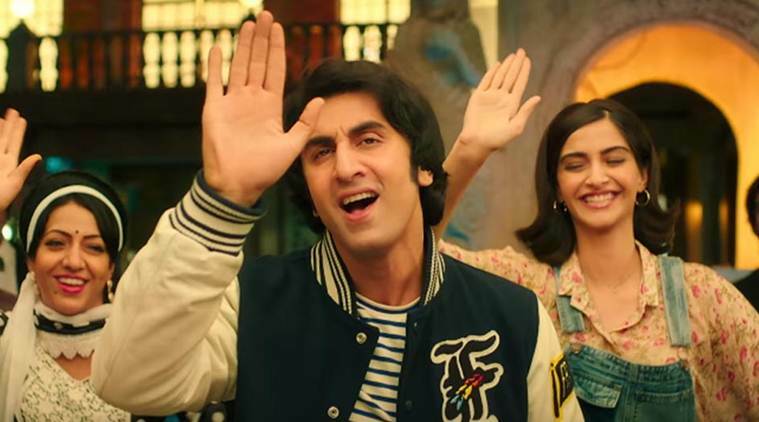 While the biopic is Ranbir’s first movie to have got such a gigantic reception at the box office, the film is also Hirani’s top opener. His last release PK starring Aamir Khan opened with a collection of Rs 26.63 crore. Race 3 sailed through the bad reviews owing to the stardom of Salman. It achieved the feat of Rs 100 crore within three days of its release. But unlike the action-thriller, Sanju has been received well by the audience and the movie critics. Now with a positive word of mouth, it is expected to cross the 100-crore mark soon. Trade pundits have already predicted that Sanju will enter the coveted 100 crore club in its opening weekend itself. Trade Analyst Girish Johar in a conversation with indianexpress.com also predicted that with brand Hirani and Ranbir associated with Sanju, the film will have a great opening.